Could Federer have won by taking more risk? My game is tennis, and I notice that an approach to risk is being played out on a point-by-point basis. An approach can be planned in advance, in the form of an overall match or set strategy, but in reality you have a point strategy, or even an in-the-moment shot strategy. So how does risk manifest itself in tennis? Well, one way is in the approaches to the net as shown in the following diagram. This is based on some fairly rough and ready research of rally length and outcomes in professional games. The average rally length in a game is around a surprisingly low five to six shots total, so less than three per player. In terms of winning or losing shots, at the top professional level of the game, this is split very close to 50:50 – it’s surprising how close a lot of professional games are in terms of points won or lost. So what is this chart showing us? This is an equivalent to a normal distribution curve for two types of tennis shot: the blue bars represent the distribution for shots played from the back of the court, and the red from the net area. There are just three points in the distribution for each shot type, as we are only interested in three possible outcomes from the shot; either it’s a winning shot, it’s a losing shot, or the rally continues so that the player gets another shot. So first to note that our flatter ’curve’ is our more risky shot, remembering the way I demonstrated risk and variability in the earlier chapter. In other words, there is more variability in possible outcome with our flatter (brown) net shot – which is what we would expect. The net shot is more risky; there is more chance of the extreme outcomes, either a win or a loss. 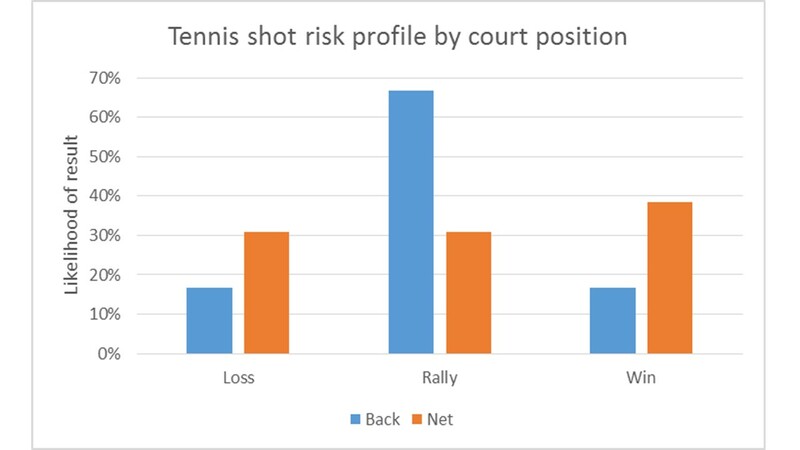 A back of the court shot is less risky; it has a more peaked profile – the most likely outcome from the shot by a good margin is a continuation of the rally. So what we see from this is that the shot which has a higher chance of winning the point is the shot at the net – ie the more risky shot. What is interesting is that tennis players know this, and yet the shot at the net is a relatively rare part of the game at the professional level today. It used to be more regularly played; up until the late 1970s and early 1980s, the serve and volley at the net was a regular way for players to win points, particularly on grass courts. Of course, there are a number of reasons why that has changed. Tennis balls are slower and make it harder to hit winners. The perfected top spin ground shot, pioneered by Bjorn Borg, changed everything, making it easier to hit dipping passing shots. And longer rallies and games means energy is a bigger factor – coming to the net expends more energy. However, the most interesting feature of this analysis is one other reason why us tennis players are more reluctant to come to the net. Yes there may be a higher chance that the shot will be a winner. But there is also a higher chance it will be a loser. And, in the tiger moment, away from rational elephant analysis, our loss aversion kicks in!